fallsmoparcity has no other items for sale. Perfect...Super Fast.....I Highly Recommend this Seller.....Thank You.. Item was as described. Very satisfied. Fixed my Power Steering Noise when Cold . 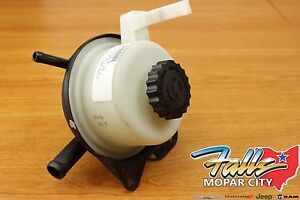 This is a original Mopar product fits your vehicle perfect this reservoir is manufactured very well also operation is very quiet don't settle for a aftermarket part if possible I highly recommend using original equipment and it's built to last nothing like a Chinese counter part keep your vehicle original equipment from Mopar. Fortunately only invested $16.00 in this New Mopar Reservoir instead of a New Power Steering Pump. Researched the Web, & there were numerous Posts addressing my problem (& the solution), which led me to try this route... so glad I did. Reservoir arrived quickly, low cost, easy installed.... a successful project !! The vehicle industry has several brands and models to offer. I chose Chrysler products. Why? Although all major brands will at some point breakdown and need repair, from my experience of being a mechanic for over 30 yrs, I've learned Chrysler vehicles go beyond the distance. So do their replacement parts.